A breakthrough program to radically change your body and awaken the sacred within your soul. A daily combination of yoga practice, meditation, diet, and personal reflection will cultivate a solid foundation from which students can live and grow. This program, designed by Baron Baptiste, runs for just under 6-weeks. A facilitator will guide you on the journey with Community Meetings once a week where the group meets to support and share together. Regardless of your level of experience, this program will reveal mental clarity, lightness of body and an illumination of spirit. You can use your current yoga membership to fulfill the daily yoga practice requirement or sign up for an auto renew membership that allows you to practice any time and at all locations. Meetings will be held at your home PYC studio. Please check your studio for meeting dates and times. Six days of yoga per week (1 day of rest). We encourage you to do 5 of these practices at the studio, but you may supplement 1 home practice per week. Each week there is a theme for your physical practice that will help you build a strong and sustainable personal practice. You will begin to build a daily meditation practice over 40 days beginning with just 5 minutes in the morning and 5 minutes at night. Each week we will build upon the tools of the previous week, adding a weekly focus and increasing the length of time slowly. Each week we look at a specific area of food, and bring attention to our habits and attachments around that food. During the fourth week we will take a three day cleanse to give your body a rest. Each week there will be a short reading and journal questions that will encourage inward self explorative inquiries. Once a week, the 40 Days group will meet and a facilitator will lead a forum in which the group will discuss that week’s readings, and excavating journal questions. The weekly community meetings are the most beneficial part of the program. As the group moves and changes together, you will find strength and encouragement from other participants. During the 40 days program I challenged my body, my soul and my mind. I changed. I grew. I was able to really “see” the person that I was. But more importantly, I came to realize the person that I want to be! Yes, the program brought a lot of pain to the surface. But now, its out! I can see it, face it and overcome it! Thank you Denise. You helped me find my strength. Thank you Heather. You helped me find joy! Thank you Pino. You helped me find my power! Thank you to all the wonderful new friends I made. You all helped me find my courage! And a special thank you to my beautiful daughter! You helped me find my purpose! Yoga was just “not my thing”, or so I thought. Om-ing and breathing loudly were “different” and definitely out of my comfort zone. Fast forward a few months later and although unsure how I ended up there, I was in the middle of my first 40 days meeting, as far from my comfort zone as you can imagine. Fast forward again 40 days later and I have taken on that uncomfortable zone in my life. I have been inspired to take life as it comes and to be proud of my choices (such as leaving my career to be a stay at home mom! )…and my oms and breathing are now loud and proud! The 40 Day program was something that I had contemplated doing for some time, it was Heather’s encouragement that made me make the commitment to myself and I am forever grateful. Each meeting I left feeling inspired and ready to embrace the week full of energy and awareness. The enthusiasm, positivity and inspiration from Heather, Pino and Denise were contagious. In my practice I feel stronger and off the mat I find myself more present. Since completing the 40 Days, I feel empowered to move forward with as much energy and strength on and off of my mat. Who I am is the possibility of…teacher training at PYC 2013 and Africa Yoga Project 2013! I committed to 40 days with hesitation – how was I juggle the program with kids, work and home? I joined the program in order to get in better physical shape, but had no idea of how much bigger my next 6 weeks would be! At the first meeting, I stood in the middle of a circle of strangers and committed to the goals of self-acceptance and letting go of expectations in my life. That first big step for me became more little steps every day of the 40 days toward living a more joyous, present life. I am certainly physically stronger, but the program was far more of a personal journey that I imagined. I am grateful for the insights I have gained, the strength and anchor through stormy days, and the new friends that I am so happy to have made. I encourage anyone looking to commit to their own journey to commit to the 40 days program! Check out your local PYC studio for their program schedule. Studios run different programs at different times throughout the year. To reserve your spot, you must pre-register and pay for the program. You can do this either online or in person. There is a no refund policy for all workshops and programs. Empower your mind and body as you journey towards the most challenging and rewarding work of your life. The physical practice of yoga builds strength, flexibility and stamina while alleviating many symptoms of pregnancy. Gentle and moderate flow of postures and breath work will support you and your baby, and prepare you for labour. Programs run for 4 weeks and are taught in a non-heated room. Pre-register at the studio or online. If you have concerns about doing yoga, please consult your doctor first. Mommy & Baby programs are a great chance for you to regain strength and flexibility in a relaxed environment while bonding with your new baby and other new parents. This series is an opportunity to strengthen your body and let go of stress. Your baby will benefit from bonding time with you and other babies while enjoying the benefits of yoga play and movements. Moms may receive hands on assists and babies may be cuddled. Programs run for 4, 6 or 8 weeks and are taught in a non-heated room. Pre-register at the studio or online. If you have concerns about doing yoga, please consult your doctor first. *These programs are offered at some PYC locations. Check out the program schedule at your home studio for location specific offerings. At most PYC locations, we offer Little Pretzel classes for your budding little yogis. It is a kids drop in yoga class that intertwines yoga poses and creative play. Little Pretzel classes are an hour long and run simultaneously with adult hot Power Yoga classes so you and your little ones get to practice at the same time. Our suggested age varies between locations. Little Pretzels classes are taught in a non-heated room and classes are drop in. Pre-registered Little Pretzels programs allow space and time for your Little Pretzel to experience and discover yoga with a consistent group of peers. Each week has a theme and offers yoga flow, educational games, and meditation and mindfulness techniques with the intention to introduce your little one to connection with spirit, compassion for others and being of service in the world. Programs run for 4, 6 or 8 weeks and are taught in a non-heated room. Pre-registration is required. Family classes are a playful and inspiring way to connect with your tribe and other families in your community. These classes focus on cooperation by incorporating fun partner poses into the flow, and result in lots of belly laughs. Come out to play and connect with those most important in your life. Family classes are taught in a mildly heated room. *If you have concerns about doing yoga, please consult your doctor first. These programs are offered at some PYC locations. Check out the program schedule at your home studio for location specific offerings. Drop off your young teen for an invigorating introduction to Power Yoga and an excellent way to set the foundation for discovering body awareness, breath, meditation and a deeper sense of self. Your teen will create connections, make friends, build self confidence and learn self awareness! Programs are taught in a non-heated room and pre-registration is required. 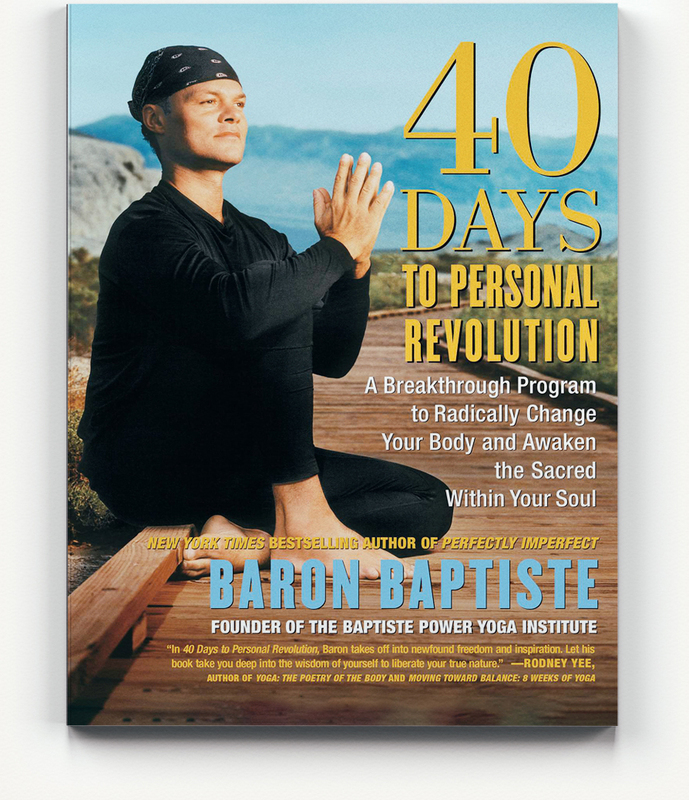 The 40 Days program for teens is adapted from 40 Days to Personal Revolution, a book written by Baron Baptiste. It is a breakthrough program that radically changes your teen’s relationship to themselves and to their body. Teens often experience a lot of pressure during this stage of their life and the 40 Days program works to address the challenges and life changes teens are experiencing as they embark into adulthood. Meeting weekly, teens discuss relevant topics guided by a facilitator and try on tools to awaken self awareness, build confidence and create direction in life. Programs are 6 weeks long, are taught in a non-heated room and pre-registration is required. This week long training is perfect for any youth that wants to develop leadership skills, gain self-confidence, strengthen their sense of self and share themselves with others. It is an opportunity for them to truly step into their power and inspire their peers to do the same. Upon completion, they will have the ability to teach a yoga class, they will learn tools to deal with life successfully and will have created an action plan to be of service to others. Pre-registration is required. *If you have concerns about your kid(s) doing yoga, please consult your doctor first. These programs are offered at some PYC locations. Check out the workshop schedule at your home studio for location specific offerings. Researchers at the Stress Reduction Clinic at the University of Massachusetts Medical Center have said that a practice of yoga along with meditation can help reduce stress and improve work performance. Are you a business owner or CEO looking to awaken the creativity of your staff and encourage healthy living? Give your staff the benefits of yoga by simply extending your health benefits to include Power Yoga Canada classes. By giving your staff the gift of yoga you will see a moral shift in your office, sick days will decrease and productivity will increase. We bring yoga directly to your office. Through our PYC Custom Corporate Yoga Program, we design a specific program for your company’s direct needs and desires. By incorporating yoga, meditation and nutrition we will provide your staff with a complete program designed specifically to stimulate healthy living and working behaviors. To set up a Corporate Program at your workplace or to learn more, email info@poweryogacanada.com. What would you do with all that extra strength, flexibility and stamina…… hmmmm? LeBron James is a huge fan of yoga and claims it has a big impact on his success. Three discs fused together. Limited mobility. Turning 50. Why not give PYC a shot as nothing else has worked. Three years later my only regret is I wished I had started earlier. The difference in my health is astonishing. More so then even that is the peace of mind that PYC has fostered. Any guy on the fence about trying PYC get yourself to the studio. It’s tough. And it’s entirely worth it. Join PYC for a weekend away or a week long vacation abroad. We combine an incredible vacation destination with yoga, adventure and relaxation to create an unforgettable experience. You will sweat, discover and transform. © 2019 Power Yoga Canada.